Cowboy Breaks Thru With First Win In 2008! The Charleston division of THE EGOLF AMATEUR TOUR held their third event of the 2008 season on Sunday, March 9 at the Crowfield Plantation Golf Club. Crowfield is a very tough layout, which plays much longer than the scorecard lists. The wet conditions did not help matters as indicated by the higher than normal scores in every flight. The course staffs were excellent host and are looking forward to our return to their course next year. The weather was beautiful with temperatures in the upper 50â€™s, low 60â€™s, and just a gentle breeze and bright sunshine. The tournament played in just over 5 hours and the pace of play was good considering the course conditions and a cart failure early in the tournament. I am sorry those players carried their bags for almost two holes. I could not do that, my bag weighs a ton. Dominic Lizarraga of Mt Pleasant won the Championship Flight with a score of 85. Mark Peper from Charleston scored 89 for second, with Mike Metz of Summerville right behind for third. Biff Huff of Charleston shot an 82 to take â€œAâ€ Flight honors. Michael Case of Detroit, MI. scored an 89 to beat out Tony Capehartâ€™s score of 90 for second. Tony is from Charleston. Tim Sumption of Summerville took â€œBâ€ Flight with an 87 over Michael Riordanâ€™s 88. Travis Hoffman from Summerville finished third with a score of 91. Joe Petro from Summerville captured the â€œCâ€ Flight with a 93 over Hal Wynne of Charleston who shot 95. Jason Brisini of Mt. Pleasant finished third with a score of 98. Cowboy of Monckâ€™s Corner captured the â€œDâ€ Flight win in a play-off over Tommy Bryant of Mt. Pleasant. I took three holes of overtime to settle this one. Both players scored 101 in regulation play. Bill Simmons of Hannahan, SC shot 102 just missing out on the play-off. The next tour stop for the Charleston Tour will be a combo event at Penny Branch Golf Club in Furman, SC. The course is west of Walterboro, SC on the west side of I-95. Players should call the course or visit our website for directions. Do not want to get lost out in the country. We would like to invite all Amateur golfers to visit our web site, come out and try the EGolf Amateur Tour. If you love golf, come out and try the tour. Anyone can play one tournament as a guest, just to see how much fun it is to play competitive golf. 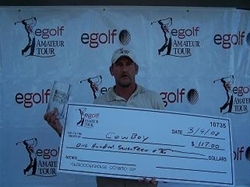 Complete tournament results and schedules can be found on our website at www.amateurgolftour.net or contact Larry Lee at ldlee@amateurgolftour.net or call 866-361-4653 or 864-491-0129.